Former British prime minister welcomes the announcement of an open-ended ceasefire in Gaza, calls for long-term plan. Former British prime minister Tony Blair welcomed on Tuesday the announcement of an open-ended ceasefire in Gaza but expressed regret at the "tragic" loss of so many innocent lives, reports the Press Association. Blair, who serves as the Quartet’s Middle East peace envoy also congratulated the Egyptian government on its successful negotiations between Israel and the Palestinian Arab factions. "The Quartet will now concentrate on a long-term plan for Gaza and for its reconstruction, including the effective and efficient reopening and reconnection to the outside world under the authority of the Palestinian Authority government,” said Blair. "Such a plan will enable a proper and decent life for the people of Gaza, as well as protect the security of the people of Israel,” he added, according to the Press Association. 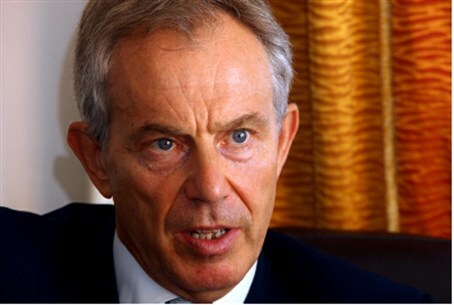 "It is only tragic that such a ceasefire has come too late to save the lives of so many innocent people," said Blair. Under the agreement announced Tuesday, there will be an immediate easing of restrictions on the two main crossings between Israel and Gaza to allow in aid and reconstruction supplies. Significantly, construction materials needed to repair the water network, electricity grid and mobile phone networks will be allowed in along with humanitarian aid, food and medical supplies. It should be noted that Israel continued supplying humanitarian goods throughout most of Operation Protective Edge. As for the Gaza fishing zone, restrictions will be lifted immediately to extend the zone to six nautical miles from the shore, to be extended later to 12 miles. Over the past eight years, Israel has set a six-nautical-mile limit for Gaza's fishermen when tensions were lower, restricting it to three miles when hostilities have escalated. Hamas declared victory and bursts of celebratory gunfire erupted across Gaza following the announcement of the ceasefire. The ceasefire does not include Hamas’s demand that an airport and seaport be built in Gaza, but Hamas leader Mahmoud Al-Zahar declared that the movement will build those anyway, even without permission. "We will build our airport and our seaports and we will not ask for anyone's permission, and whoever will attack our ports and our airport we will attack their own ports and will once again attack again their airport," he said. United Nations chief Ban Ki-moon, like Blair, also called for the return of the Palestinian Authority (PA) to Gaza. PA Chairman Mahmoud Abbas’s Fatah movement was chased out of Gaza by Hamas, which staged a bloody coup of the territory in 2007.